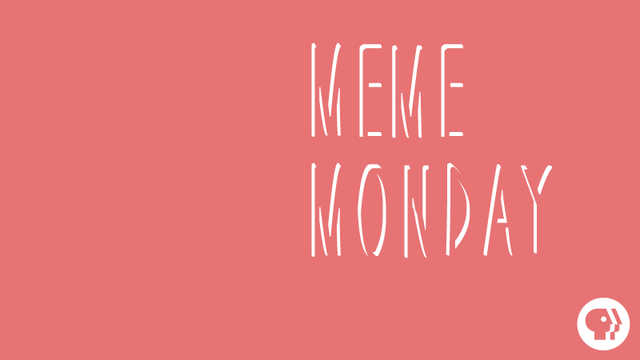 Meme Monday is a weekly blog series designed to brighten up what is usually a dry start to the week with joy and laughter. The PBS internshave collaborated to bring you the Millennial’s perspective on issues that everyone encounters on a daily basis complete with funny graphics like gifs and memes! This is the second post in a mini Procrastination series. Missed the first post? 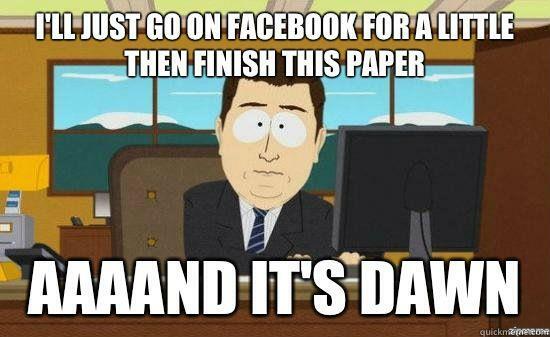 Read about the 7 Stages of Procrastination! 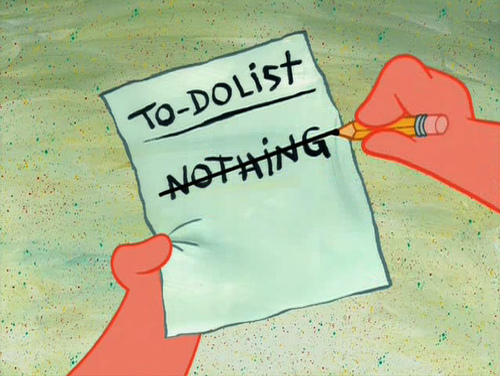 Last week, we embarked on a journey to uncover the mysteries of the plague that has ceased the nation: procrastination. If you read the diagnosis that spelled out the signs that you may suffer from procrastination and feel as though there is no way out, fear not! This week we bring you the cure; tips that we have found help us during big projects, rushed deadlines, and amped up emotions. Use one or all of these to accomplish your future tasks in a more time efficient manner. When you have a million things going on, it’s easy to forget about something important until you realize it’s the day you are supposed to submit the project. Making lists is a great way to give your brain a break because you can see what you need to do. When Jena Prats makes lists, she is able to keep track of dates, prioritize accordingly, and then she even tries to finish at least 80% of the tasks before schedule. “Having a calendar and making lists with boxes to check off tasks is extremely helpful. Seeing the box filled mentally gives a satisfaction of completing an assignment.” – Jordan Coggins. Megan Dumond uses the biggest distraction in her favor to combat procrastination: technology. She uses the SelfControl app to block her access to Facebook and Netflix, her most common foes when it comes to getting work done. The app restricts you from using certain websites for a certain period of time. Oh and don’t try to outsmart the system by restarting the computer or deleting the app; they've already thought of that. If you want a more tech savvy way to make lists, Megan suggests using iCloud reminders,Evernote, and Wunderlist! It is easy to get overwhelmed by big projects which can cause one to put off the whole thing because just thinking about what needs to be done can cause stress on its own. However, Mackenzie Woods thinks it’s much easier to work on projects “in small, manageable pieces under an approaching deadline.” From there she distributes her work evenly by limiting the amount of time she can spend on any individual component of the task. Taylor Berglund knows that breaking a large project into smaller jobs is a slight shift but can make all the difference. He may not feel like writing a 10-page paper after work, but starting with some research doesn't sound so bad to him. Who doesn't like a little reward for a job well done, even if it’s a gift to you, from you? As you work on your assignment, it’s a good idea to give yourself incentives each time you reach a milestone in your progress. Samantha Elander suggests rewarding yourself with a sweet treat every time you complete a task or taking a 10 minute break for every 40 minutes of work you do. Sometimes when your minds not in the right place to complete a project, anything can distract you. I should file these papers, the yard needs a little work, my room’s a mess, how many people are in space right now; these are all thoughts that can surface in the midst of a large project that will take you off track to complete your assignment. When this happens, I find it helpful to lock myself away from everything and everyone. When you’re in a room with just yourself and your assignment, there isn't much else for you to do but the assignment. Don’t leave solidarity until you have made some serious progress or completed the assignment, you will eventually get in the zone. Joche is the one of the marketing and communications interns with the PBS Digital SPI Team who handles a lot of the social media. She is a rising sophomore at University of Maryland, where she studies marketing. When Joche is not tweeting, pinning, or blogging, she spends a lot of her time window shopping, catching up with shows On Demand, or jamming out to the radio. If you liked the contributions of my fellow interns, follow them on twitter! Samantha Elander and Jordan Coggins are both interns with PBS LearningMedia. Megan Dumond is an intern with PBS Kids Digital Products and Ready to Learn. And you should remember PBS Digital interns Jena Prats, Mackenzie Woods, and Taylor Berglund from their previous Meme Monday contributions.